The opening chapters (and indeed, the whole first quarter) of “Bumped” set a whole lot of rules. I’M SIXTEEN. PREGNANT. AND THE MOST IMPORTANT PERSON on the planet. According to the Babiez R U ad, anyway. McCafferty, Megan (2011-04-26). Bumped (p. 1). HarperCollins. Kindle Edition. I LOVE THE MEADOWLANDS MALLPLEX! It’s fast and loud and bright and buzzing with temptation but that’s why I love it. I love it because there’s no better place for me to do the work I was born to do: to spread the Word. McCafferty, Megan (2011-04-26). Bumped (p. 4). HarperCollins. Kindle Edition. The two are mono-zygotic twins, separated at birth. Melody was brought up by economists, who did everything they could to groom her into a professional baby-maker, while Harmony was adopted by a Very Secular Family Indeed. But, lo, both of them are uncertain about their roles in life. Melody has to practice her enthusiasm at being pregnant, as it doesn’t come as naturally to her as it does other girls, while Harmony… well, I’ll get to Harmony later. Already, we may roll our eyes at the recycled trope - Twins? Separated at Birth? No, we never heard of this before! - but the truth at hand is that Melody and Harmony are not a special case. In a world where the only people able to reproduce are teenagers, many children are not raised by their own parents. And, as Melody would soon tell us, she and her sister were born addicted to the same drugs their mother was using at the time. The musical names she picked out for us are proof enough of her pharmaceutically addled mind. McCafferty, Megan (2011-04-26). Bumped (pp. 13-14). HarperCollins. Kindle Edition. And so we discover why our protagonists are not named something more common, like Jacinda and Ruby. Names, as anyone who has read Ursula K LeGuin knows, are important, and this here is a really nice touch. Usually, writers would opt for a “serious” name, Lucy or Emma or Kate, no doubt because names like Caroline-Rose or Celaena Clare belong to a fanfiction website and have no place in any “real” book. 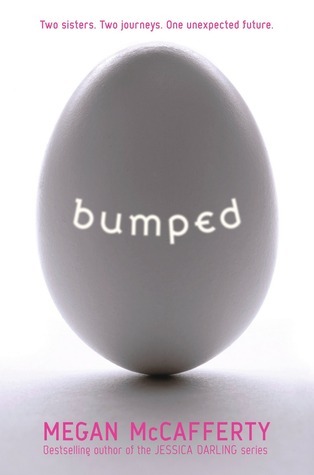 “Bumped” though? Doesn’t give two shits about it. Note, though, the verb “tell” - one of the downsides of the first few chapters (and, well most of the book, really) is that the dialogue/description ratio is painfully leaning in the direction of the latter. Even though Melody and Harmony have their own sections and story lines, they spend precious little time talking to each other, or interacting in any meaningful way. We cotton on that Harmony is excited about their reunion, and we also gather that her zeal makes Melody uncomfortable, but there is also a deeper issue at hand. McCafferty, Megan (2011-04-26). Bumped (p. 13). HarperCollins. Kindle Edition. Though Melody is unsure about her purpose as a surrogate mother, she is much more terrified of Harmony coming along and stealing her thunder. We don’t know why yet, but we will soon experience enough of this world to understand the magnitude of Melody’s terror. To put it simply, she’s sixteen and pregnant and the most important person on the planet… so long as there is only one of her. Twinhood (and drugs, really) will both play a vital part in the story later on. Harmony’s own issues come in the form of feeling “incomplete”. Despite her love for her adoptive parents and house-sisters and house-brothers, she never truly fit in, so when she discovered her long-lost family, she was excited to establish a connection. On the surface, her intentions are to help Melody find religion. But deep down, there is something else she needs. Finally, after a difficult and dark period in my early Blooming, Ma took me aside and told me something I’ll never forget. “Prayers are answered in one of four ways,” she said. “Yes. No. I have something else in mind. And . . .” She paused long enough for my impatience to show. I realized that maybe I wasn’t ready for the answers God had in store for me. McCafferty, Megan (2011-04-26). Bumped (p. 18). HarperCollins. Kindle Edition. Harmony, I find, is a very uncomfortable character at first. She’s quick to invoke God and His word and is, generally, the kind of person to leave lots and lots of awkward silences after they speak. But she isn’t just a regular “Churchie”, either - not just because of her feeling of “incompleteness”, but the fact that she is incredibly, unflinchingly proactive. The one-way fare cost all the money I had in the world, but that’s just one of many worries I’m choosing not to bother myself with right now. McCafferty, Megan (2011-04-26). Bumped (p. 6). HarperCollins. Kindle Edition. I mean, how many girls would give up all their money in the world for a one-way ticket, to visit a relative they only met a month ago and whom they don’t really know all that well. Harmony can come across as either TSTL or just naively stubborn, but there is no doubt about the fact that this girl has ovaries of steel! Despite her reticence, just standing next to my sister is as exhilarating as cruising across the Benjamin Franklin Bridge, over the Delaware River, the cab taking me out of one state and into the next just as the sun crowned the horizon. . . .
That’s how I lost my best veil. I longed to merge with this glorious landscape! I longed to unite with the majestic skyline! I longed to revel in His goodness at a hundred miles per hour. I lowered the window and stuck out my head, and shouted out. McCafferty, Megan (2011-04-26). Bumped (p. 7). HarperCollins. Kindle Edition. Just to make the point clear. We don’t learn much else in these first four chapters (they are Cat’s Cradle short, if you will), so before I log off, let’s talk a little bit about openings and all the things they need to accomplish. Any writer’s guidebook will tell you that your opening chapter! Page! Sentence! Word! Is uber-important because you need to hook the elusive reader before they moved onto Cassandra Clare or whatever has a shinier cover. There’s a list of Must-Dos and a list of Big-No-Nos, there’s the shades-of-gray area about Prologues, there’s the Absolute Ban on Dreams and Mirrors and Descriptions of Your Protagonist Waking up… all in order to accommodate the commercial buyer’s limited attention span. And that’s just for your regular literature! Genre fiction, like dystopia or sci-fi or fantasy, has the extra weight of quickly introducing you into a world not like your own, without falling into the trap of infodump. That’s hard! Though “Bumped” does little in the way of dialogue, though, we don’t really know much factual information about this world. In fact, the few indications this is, indeed, genre fiction - HPSV, fun bumps, Melody’s eyeball computer - are so tiny, you can blink (no pun intended) and miss them. McCafferty showcases the changes on a micro level - the way of thought, the nuance in language, the throwaway references to the sisters’ real motivations - and this sets us up for the rest of the book. “Bumped” allows us to view this world, not through the eyes of ciphers, but through those of the people living in it. It only stands to reason that we’ll get to know them better. What do you think? What is your favourite opening in a book? What, do you think, is the best way to showcase a different world, and how does your favourite author go about it?